So here’s the thing: the Academy Awards are a mess. The weeks leading up to it were a PR nightmare, and its confused identity leaves it unable to catch up to the lightning-fast pace of culture. Despite this, the Oscars matter, and everything they represent is crucial to anyone who loves film. Most of the winners were exciting and heartfelt, with a glaring exception. Surprisingly, the hostlessness was not a detriment. Bits played out by hosts throughout the past few years — like Neil Patrick Harris’s painfully awkward briefcase stunt — were replaced by more succinct, yet more memorable moments like Keegan Michael Key’s Mary Poppins introduction. Bradley Cooper and Lady Gaga’s performance of “Shallow” stole the spotlight from the already-dazzling lineup of performances, such as Queen and Bette Midler. It was also thrilling to see Black Panther win three technical awards, Spike Lee win his first Oscar for Best Adapted Screenplay, and Regina King win Best Supporting Actress. Spiderman: Into the Spiderverse winning Best Animated Feature was a hopeful indicator that this award could be an open field for different narratives and animation styles apart from Disney/Pixar. Celebrating the centrality of Black stories makes me sadder to discuss the big winner of the night. Of course, I refer to the Best Picture-winning Green Book, a movie about white people realizing that racism is — wait for it — bad. Seeing the parade of white filmmakers walk up the stage to accept their award was quite the image. In a year with such bold and diverse voices, it’s incredibly disappointing to see another mediocre white savior movie represent an excellent and exciting year for film, featuring the same watered-down message about race designed to make audiences feel good rather than encourage critical thought. While it’s tempting to stop yelling into the void and dismiss the institution altogether, but yelling into the void is to engage with culture, use our voice, and to push forth the things we care about. Indeed, productive debate about the direction of film, and how we as a culture can continue to challenge it, is precisely why the Oscars are so important. The Academy Awards, above all else, are a celebration. As movie theatre attendance continues to decline and independent movies continue to struggle, this night is an assertion of our values in film, and our willingness to preserve it. 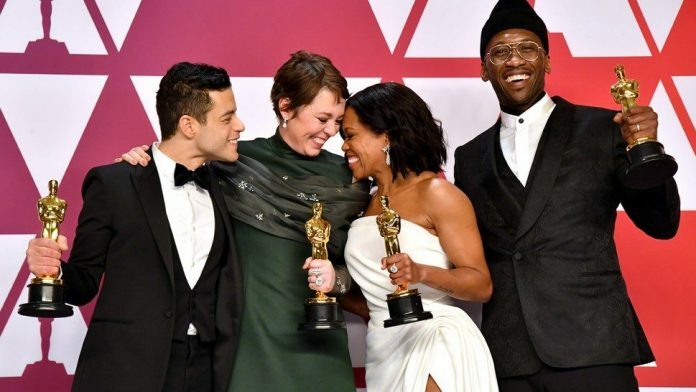 The Oscars will — and must — survive, because they include so much more beyond the formal Academy: they include the entire movie going public, from superhero fans, entertainment journalists, couples on Valentine’s Day, and everyone in between. This illustrates their non-negotiable importance in the world of filmmaking and film audiences in general. This is why I argue that culture dictates the Oscars just as much the Oscars dictates culture. Because the two are mutually reinforcing, the telecast and the awards themselves do not make up the entirety of the Academy Awards. This institution lives and breathes through the participation and enthusiasm of those who are engaged with it. The Oscars still matter because whether we like it or not, film-lovers and the Oscars embody each other. Forever in a state of mutual dependency, both entities will continue to shape the movies we make, and the movies that make us who we are.